Once again, I must describe my distaste for the use of cartoon characters on beer labels, but since the girls bought me this one as a welcome home present, I’ll give it a fair shot. And it does seem a rather refined brew: it sports a bow tie and claims to come “with taste evolution”. It’s a lovely dark beer with a thick head. The first taste is sweet, with a bit of that black cherry cola, like Bobeline Brune. I’m reminded of Moinette Brune, too. It also has a strong burnt malt note that turns sour in the aftertaste. It’s missing the extra flavours of the Moinette, however -- no cinnamon here -- and overall, it’s not as complex. 9% alcohol. I think, it’s a bit too sweet for me. 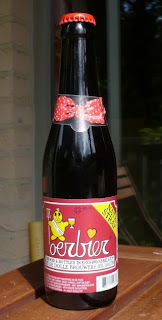 The little cartoon character on the label may be cute, and it may be a well-dressed bottle, but still, it hasn’t wowed me much.